We provide our clients with dedicated coaches to ensure consistent quality of coach transport. Our dedicated support team works around the clock, providing a full backup service 7 days a week. It is important to us that we maintain a high standard of customer service because we believe that people are what will make the experience memorable. Passengers will feel confident, safe and entertained when on board our coach lines because our drivers are highly skilled, knowledgeable and have trained to provide first class customer service. The tangible benefits of a luxury coach line, paired with the intangible benefits of premium service is what makes Johnston’s one of the best in the business. Johnston’s Blue Taxis Limited was established. Johnston’s Blue Taxis Limited became ‘Johnston’s Blue Motors Limited’(JBML) & began sightseeing tours in Titirangi, Auckland. Early 1960’s – JBML was acquired by Auckland Transport Holdings Limited. The distinctive blue livery was removed & instead vehicles sported a rather bleak combination of cream & brown. 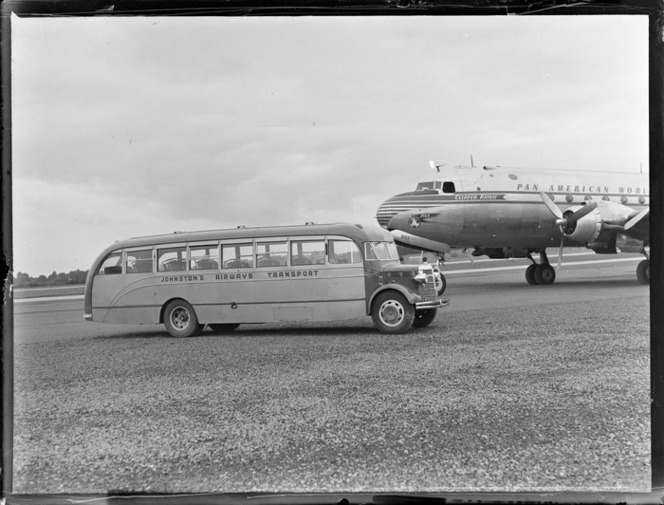 Late 1960’s – JBML began coach tours around the whole of the North Island. Early 1970’s – The coaching side of JBML was sold to Midlands Coachways Limited (a well-established coaching business in the South Island). The airport service remained as a part of ATHL. Late 1970’s – Coaching side acquired by South Pacific Travel Limited. The livery returned to the distinctive blue & white. The Airporter brand was established (today it is called airbus). 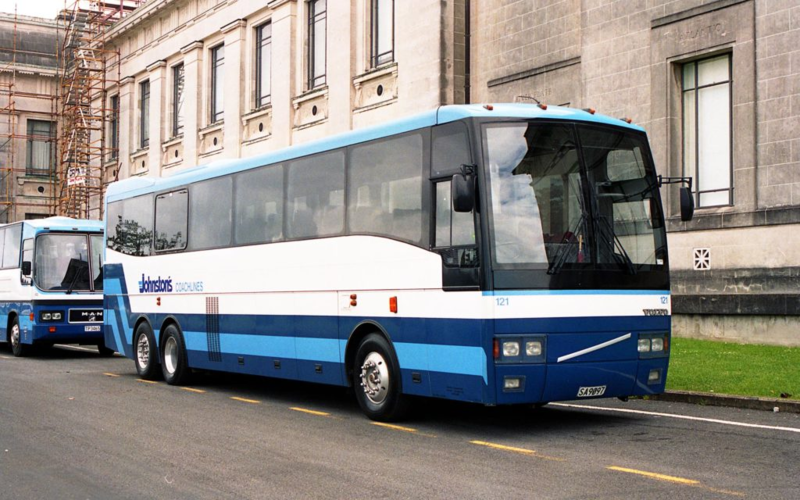 Early 1980’s – The coach division was reintroduced in the North Island. 1986 – Re-entered the South Island Tour Market by purchasing 4 coaches from Pacific Tourways. This contract was arranged by our very own Garth Stewart. 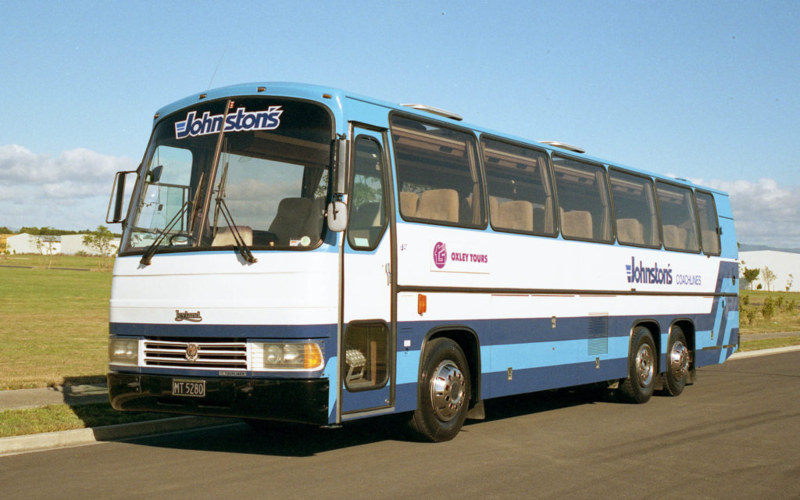 The coach division was split from JBML & the name was changed to Johnston’s Coachlines Limited. JCL was sold to ‘Corporate Investments’ the owners of Newman’s. They continued to operate as separate brands. Later, Corporate Investments divested the coach operation and introduced a helicopter line. JCL became their lead brand and Newman’s disappeared. THL ran the largest operation in NZ with 140 coaches and in that year was sold to TR Group. 1 September, TR sold JCL to Go Bus Transport Limited & Johnston’s Coachlines New Zealand Limited was formed.